The Greatest Claim is a 1-4 player game of economy, mining, gem collecting, and, eventually, the escape of a collapsing mine. 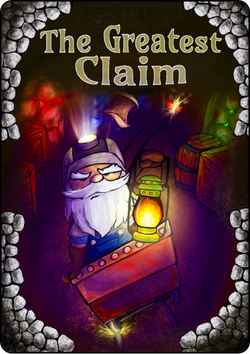 You, and a few other lucky prospectors, have inherited a claim on a rich but unstable mine. Get in, get your gems, and get out before the whole thing comes crashing down! Race to discover the richest cavern, gather the most gems, and prove your claim the greatest! Visit the Trivatch Games Facebook Page for news and updates.